On March 31st, COGLAHA will be returning to the U.S. Bank Arena as the Cincinnati Cyclones host their You Can Play Pride Night. COGLAHA members and possibly a few special guests, will take to the ice at 2PM in a inter-squad scrimmage and skills competition! Afterwards join us as we cheer on the Cincinnati Cyclones host the Toledo Walleye in their last regular home game of the season. You won’t want to miss the action on the ice, and the $1 beer and hots all night long. You’ll also get to be one of the first to see the Cyclones 2018 You Can Play video, showing their commitment to making hockey a place for everyone. For tickets, please goto the Groupmatics Ticket page. To Register as a player, please goto our Cyclones Player Registration Page. – Pride Night ticket proceeds benefit COGLAHA & Cincinnati Pride. 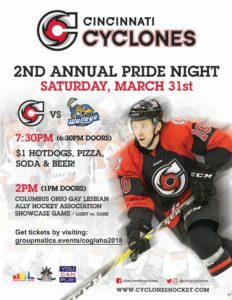 – The Cyclones will unveil their second You Can Play video in-game during Pride Night, becoming one of only a few ECHL teams to participate in the project to end homophobia in sports. – Pride Night is also $1 Concession Night where most concession items are only $1.